Let me clear in advance that I am not a critic or an expert to talk about the technicalities of movie making. Hence this is not a review but just my views about the movie. Dispite the controvorsies revolving his personal life lately, he has managed to promote the movie just on the basis of the movie itself. Unlike other movie stars, I had seen very few hungama for TZP promotions. The caption of the movie is” Every child is special”, am not sure if all are but yes Ishaan Avasti who is played by Darsheel Safary sure is and so is Amir Khan as a debutant director. The movie is well executed and has the right ingrediants necessary at the right place. Nothing overdone; no excess shots squeezed in to show the struggles of kid with his diability. Infact Ishaan is by far the character who is happier than the other charaters, playing his pranks and living in his la la land of dancing letters and jumping cartoon images. 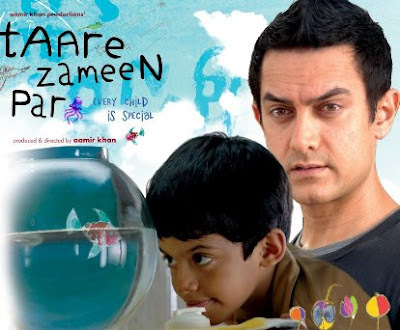 Aamir has been able to show to the audience the vulnerability of kids and that every kid has a pace of their own. In this competivitve age somewhere down the lane todays parents have forgotten that and are in a constant race to see how far better, smarter and fast learner are their kids in comaprison to their peers. TZP has made us take a step back to understand the each kid has to be handelled uniquly. And like the old saying spare the rod and spoil the child funda doesn’t work for every other kid. This movie makes us realise that if your kid is a slow starter that dosnt mean that they are stupid or dumb. Just that they have to be taught in a different way. Overall its worth the 500/- bucks I spent (including the snacks :D). A must see for every one, especially parents and teachers.